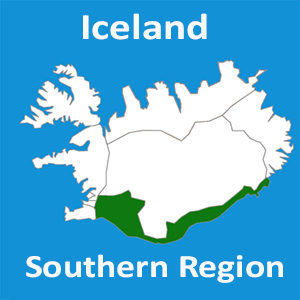 The south coast of Iceland is the home of some stunning natural wonders and spectacular places to visit. This tour highlights the iceberg lagoon Jökulsárlón, the Diamond beach, a visit to an actual Ice cave, and the waterfall Seljalandsfoss. As evening approaches on our way back to Reykjavík, we start looking for the Northern light’s and make a stop if we spot a glimpse of Aurora Borealis. The tour starts at 7:30 in the morning as we pick you up at the hotel or a bus stop near your hotel. And you are in for a very long day with visits to breathtaking paces. Your drive is a comfortable luxury mini-bus or a jeep, taking you to all the best highlights that the south coast has to offer in one package. First, we aim for Jökulsárlón, iceberg lagoon. The lagoon is a part of the Vatnajökull national park south of Breiðamerkur glacier tongue. At the lagoon, you will enjoy the icebergs floating to the shore and possibly see some seals and birds in their natural environment, diving, and surfacing in the glacial lagoon. On the other side of the Ring Road, the no. 1 highway in Iceland, just by the lagoon, you can take a walk down to the Diamond beach where icebergs float by the shore glowing like crystals. Truly a unique experience and maybe a once in a lifetime opportunity. From the iceberg lagoon, we drive to the edge of the glacier tongue Breiðamerkurjökull to visit a natural ice cave. Here we take caution and provide everyone with the proper safety gear and lights before entering the cave. After the ice cave, we drive to our final scheduled stop, Seljalandsfoss waterfall where you have an option of walking behind the cascade. During the winter months, the waterfall is lit up and provides excellent photo opportunities, especially if the Northern lights appear. As the Northern lights can be very elusive, their sighting cannot be guaranteed. But if conditions offer a glimpse of hope the drive back to the city is a constant Northern lights hunt. You can expect the tour to take 14-16 hours, so you need to bring some snacks for the ride. Along the way, the driver will also be making short stops during the tour at service stations and small convenience stores for additional food and meals. A driver guided tour on the south coast and ice cave visit. Truly a great tour for a combination of landscape, scenic drive, ice cave and northern lights. This tour is not offered at the moment.